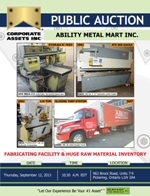 Corporate Assets Inc. | Ability Metal Mart Inc. - Corporate Assets Inc. FABRICATING FACILITY & HUGE RAW MATERIAL INVENTORY FEATURING: HINO (2007) 30' box truck; HACO (2002) 150 ton x 10' CNC press brake; GEKA (2002) HYDRACROP 110/SD, 110 ton hydraulic ironworker; HYD-MECH (1998) S20A SERIES II, hydraulic band saw with power bundling and clamping; HYD-MECH S20A horizontal band saw with power clamping; DARBERT 10' x .25" hydraulic shear; CLARK 4000LB forklift; GMC 1500 pick-up truck; MASSIVE OFFERING OF USEABLE RAW MATERIAL, CHANNEL, I-BEAM, FLAT BAR, TUBE, ETC.. CONSISTING OF ALUMINUM, COPPER, BRASS, STEEL, PLATE, CHECKER PLATE, STAINLESS, OFFCUTS & MUCH MORE! ; POWER FIST air compressor, large assortment of heavy duty cantilever racking to hold raw material, jib arm hoists, rolling band saws, steel shop carts, drill presses, press brake dies, office furniture and equipment & MORE!